Special holidays are what Evermine is all about, and that means you can celebrate your Thanksgiving with big style! Our small, perfectly personalized Thanksgiving accessories and favors (including labels, tags, place cards, coasters and more) really dress up your holiday gathering. We've collected some of our favorite thanksgiving ideas to help inspire you. Use your words and photos or art with our Thanksgiving styles, shapes, and colors for perfect Thanksgiving celebrations. Ordering is fast and easy, and you can order just the amount you need! You pick the style, shape and color, and then personalize the Thanksgiving labels, tags, coasters and cards with your own words. You can also use your photos to create an even more personalized product. 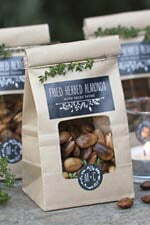 They're ideal for autumn canning projects, fall celebrations and parties in September, October, and November. Perfect for giving homemade Thanksgiving treats to family or friends. We've picked out some of our favorite customer Thanksgiving products above to show you what you can do. 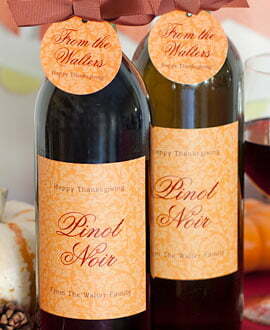 Personalized Thanksgiving labels for the table, for the favors, for the glassware. Get tiny round labels (shape 28) and print your Thanksgiving theme 'Thanksgiving with the Millers', place them on your stem glasses or drink glasses. Use other larger sizes, such as the scallop circle or the square, for your favor packages or bags. Use them to seal your rolled napkins. Add to garlands or other decorations to add a personalized touch to your festive decorations. 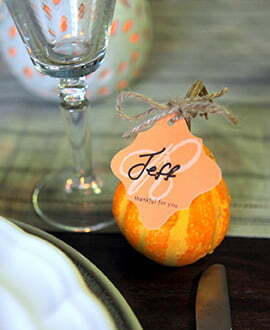 Personalized tags to add to your Thanksgiving table decor. Tie them onto Thanksgiving favors for guests to take home with them. Hang them on your 'Thanksgiving tree' or floral centerpiece. 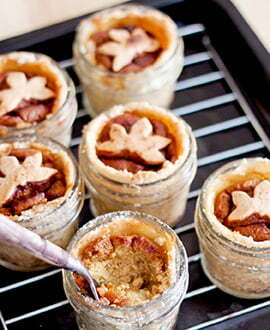 Affix to toothpicks, and perch them atop cupcakes or your pies. Make tags into place cards by tying onto gourds, dried Indian corn or other Thanksgiving decoration, and hand-write each person's name on each one. Coasters add an enormous amount of warmth to your Thanksgiving gathering when they have your name with a photo of you, your home, your children, or something else that personalizes the celebration as uniquely yours. 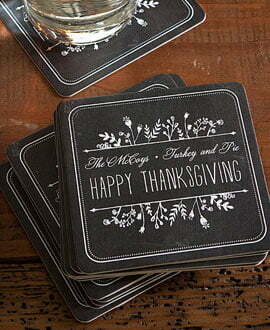 Choose a visual theme, choosing from one of our many styles of Thanksgiving coasters, and personalize them with your words. Place cards. 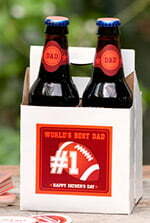 Personalize them for your family holiday. Write the name of each guest on a place card and set them on the table at the perfect place for each person. Dish identifiers. Another use for place cards is to use the dotted line at the bottom to hand write each dish of food, so people know what it is, what's in it, or who made it. This is very helpful for people who are gluten free or dairy intolerant, vegetarian, etc. Free Thanksgiving Printables — recipe cards, an alphabet garland, a thankful sign, thankful cards, acorn wrappers, and more. Plus, go to the Evermine blog to find more Thanksgiving ideas (cinnamon pear jam, Orange ginger cranberry sauce, pumpkin pie in a jar, gourd place cards with ornate violin shaped tags, acorn cakelets, and much more). 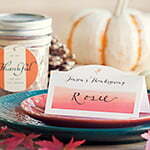 Make your Thanksgiving celebrations extra special with personalized Thanksgiving favors and accessories from Evermine. Looking good has never been easier!